Manali, in Himachal Pradesh, is one of the best places to experience nature wholeheartedly. Manali and the nearby destinations are perfect to spend good outdoor time and also to relax and unwind yourself. That’s why we are going to tell you about 10 such places in and around Manali that you can visit alone with family to take a break. The closest destination from Manali is Solang Valley and it attracts a lot of visitors throughout the year no matter what season it is. During winter the entire town is covered in glittering snow and during summer the sun kissed tress and mountains look mesmerizing. If you reach here in the month of January to March you can enjoy some fun and adventurous sports like skiing and snowboarding. Once the snow starts to melt and the sky is clear you can take part in paragliding too. Don’t worry about safety, these are trained pilots and you will be flying with a strong harness securely attached to the glider. You can also enjoy trekking towards the famous an old Shiva temple. Rohtang Pass route is favourite among the travellers. Since there will be many travellers trying to reach to Rohtang Pass heavy traffic usual. 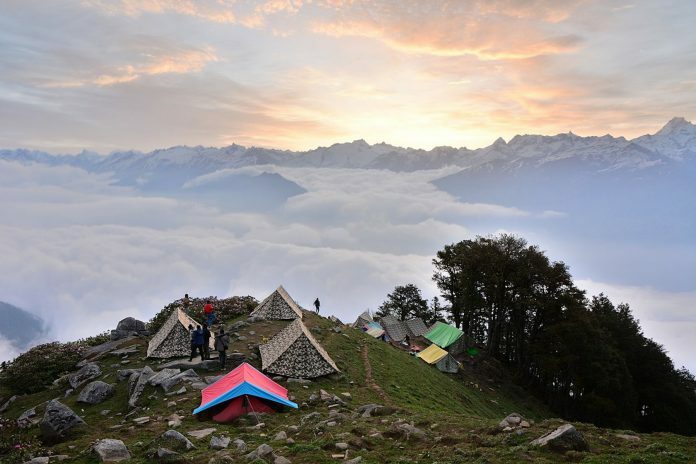 It will take you around 2 to 3 hours from Manali to reach here depending on the traffic. Rohtang Pass is 13,000 feet from the sea level, hence snow fall is common and you will also see a lot of snow lying on both the sides of the road. Well, people travel here particularly to witness snow even during summers. During winters you can enjoy a lot of snow specific sports as well. Make sure to visit here once you reach Manali. Another adventure trip that you can make is to Beas River. The scenic beauty will surely take your breath away. Along with rafting, you can also try the most famous zip-lining as well. You will see a lot of small companies offering you discounts on rafting and zip-lining, you can get in touch with any one of them. During rainy season rafting will be closed because of strong water force. Rafting season begins from April to June and after monsoon from September to October, it starts again. You can easily arrange for a trip to Beas River from Manali and book rooms in Hotels using oyo rooms coupon codes . If you want to go to quiet and peaceful place then visit old Manali. This quintessential place will leave you speechless. You can see traditional style Manali homes, tons of guesthouses and cafés offering local and modern cuisines. Visit here and leave your stress behind. Look at your environment and breathe in the fresh sir. You can go to spots like Manu temple as well. To reach here you will have to take a steep walk which will be worth it. While you stop in Old Manali for a sightseeing tour, don’t miss to visit Hadimba temple. This temple is also known as Dhungri temple. It’s a really ancient temple built in 1553. The wood cravings and the peaceful environment makes this temple a must visit. In the entrance of the temple, you can take a yak ride and click some pictures with the famous Angora rabbit. There will be many ladies carrying the fluffy rabbit in their arms and asking you to click a photo with the rabbit. Well, you will have to pay something for that obviously. This temple celebrates a three day temple festivals and attracts a lot of visitors from around the world. Manali is popular for its greenery and sun kissed mountains and so is the Manali Nature Park. The thick cedar trees, lush green forest, women carrying tons of dry grasses, the mystic feeling, and the peaceful environment makes this place one of the best. Another place near Manali that you can go to is Vashist. It is juts opposite to Beas River and you will find an array of affordable guest houses here. If you are into meditation then you can come here for Reiki sessions, spa and Ayurveda massages, and for tarot reading too. These things are very popular in Vashist. You can come here from April to October. Other than that there are many temples to visit here as well and yes don’t miss the hot springs. Don’t forget to visit CouponsCurry near that place in Manali to save money. Manali is famous for its Buddhist temples too. Towards the south of Manali lies a small Tibetan colony and it is famous for its peacefulness and serenity. Himalayan NyinmapaGompa has a huge Lord Buddha statue which is entire made of gold. It was built in 1960 by the Tibetan refugees. If you are looking for a hiking spot then go to Jogini waterfalls. It’s close to Vashist temple and the Jogini waterfalls will leave you speechless. It’s mesmerizing and the scenic beauty can only be experienced. You can book a room in one of the affordable guest houses too. Previous articleHow to Write an Effective Inspection Report?